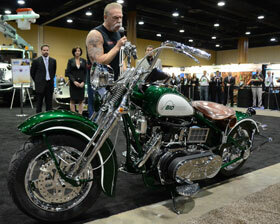 The big news today at the conference was the unveiling of the biodiesel bike built by Paul Teutul, Sr., Orange County Choppers. The bike was built in partnership with CIMA Green. Today the bike debuted on stage driven by former NBB Chairman, Ed Hegland. Then Paul Sr. himself drove it onto the biodiesel vehicle showcase floor where he talked about the project with attendees. CIMA Green actually had two bikes built and donated one to the National Biodiesel Board along with a check for $50,000 to use for transportation expenses to showcase the bike at various events around the country. I spoke with Paul Sr. just prior to his entry into the exhibit hall and he says the bike was a tough one to build. He says it’s not a speed demon but it won’t break down, “It’s just made to go.” The bike has affectionately been named Susie, btw. Listen to my interview with Paul Sr. here: Interview with Paul Sr.
Here’s video of Paul, Sr. driving into the exhibit hall.